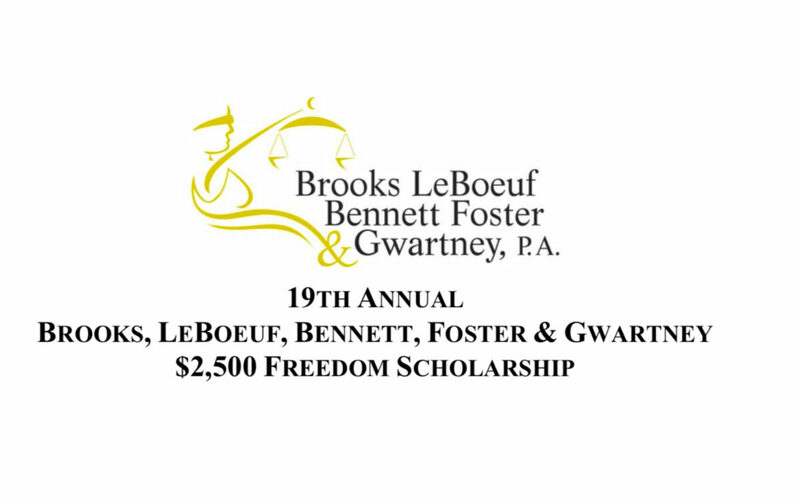 19th ANNUAL $2,500 FREEDOM SCHOLARSHIP | BROOKS, LEBOEUF, BENNETT, FOSTER & GWARTNEY, P.A. The Brooks, LeBoeuf, Bennett, Foster & Gwartney, P.A. Freedom Scholarship was established in 2001 and the firm has since awarded $45,000 to assist students in achieving their educational goals. The law firm believes that a college education is an important step in attaining individual personal dreams. We believe the freedoms, afforded by our Constitutional Bill of Rights, make these dreams possible for all Americans. The scholarship recipient will be selected based solely on the merit of a personal essay. The essay topic is: The Bill of Rights: What it means to me as an American. To apply, you must send a completed application with your original essay to the law office of Brooks LeBoeuf, Bennett, Foster & Gwartney, P.A. The application and essay must be received by the law firm no later than 5:00 p.m. on Friday, April 5, 2019. The scholarship check will be presented to the winning student at a presentation after the winner is notified. The applicant must be a high school junior or senior, and a resident of Leon, Wakulla, Gadsden or Jefferson County. The completed application and three copies of the essay must be received by Brooks, LeBoeuf, Bennett, Foster & Gwartney, P.A., by 5:00 p.m. on Friday, April 5, 2019. Essays may not be faxed or emailed. The essay must be a typewritten, original composition containing no less than 500 and no more than 1,000 words. The essay subject must be: The Bill of Rights: What it means to me as an American. No more than one essay per person. The essay may cover one, any combination or all of the first ten amendments to the Constitution. Only one essay may be submitted per person. No current or past employees or immediate family members of Brooks, LeBoeuf, Bennett, Foster and Gwartney, P.A. or the independent celebrity judges are eligible to enter the competition. The top essays will be submitted to a panel of independent celebrity judges who will select the award winning essay: One scholarship in the amount of $2,500 will be awarded directly to a high school junior or senior. The winning student will be featured on the Brooks, LeBoeuf, Bennett, Foster & Gwartney, P.A., website – www.TooMuchAtStake.com. For more information call (850) 222-2000 or visit www.TooMuchAtStake.com.